2b. Thesium hookeri var. jarmilae (Hendrych) Y. Nasir, comb. et stat. nov.
Holotype: Phungchut (Arun) vy., 11,500 ft., Tibet, stony slopes, E. Norton 110(K). Distribution: N. E. Afghanistan and eastward to Tibet; mainly the inner dry ranges. The variety jarmilae was previously considered as a distinct species and included in the series Macrocarpa Hendrych. Hendrych (1962, p. 11) characterised it by the large fruits (5-6 mm) and perianth (3-4 mm). The Type examined (K) has fruits only 3 mm broad and perianth 2 mm long (in dried state), which are the same as in var. hookeri. The specimens that Polatschek (1982, p.4) cites under Thesium himalense are referable here. 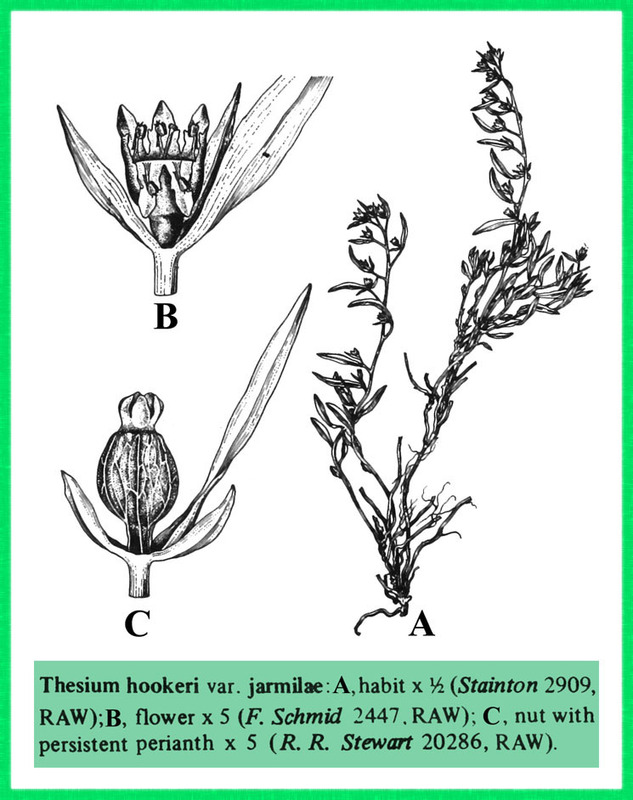 It appears that Thesium jarmilae is only a high altitude form of Thesium hookeri, characterised by its compact habit and well-developed stolons. It is found mainly in the dry inner ranges of the Himalaya, from altitudes of 2743-4500 m.